"When you’re in a groove, biking and painting are so much alike. Time flies by, your brain goes on automatic pilot, and things just flow." Some time ago, a few of us were grabbing a drink before taking in a ridiculously good show wherein Beach House opened for The Walkmen. About halfway through that pre-concert social session, one of us looked up and saw some handsome paintings gracing the upper walls of this particular establishment and vehemently brought these paintings to the attention of the party. A good portion of our remaining time there was spent alternately sipping said drinks and seriously adulating those paintings. The artist in question and whose work we could not collectively stop thinking about or discussing for many days? Jackie Avery. Boneshaker Almanac: How long have you been painting? And when did you become interested in bicycle portraits? JA: I’ve been painting all my life. My mom is a professional sculptor, and I really have her to thank for demonstrating that making art is a valid career choice. She is very nutty and irreverent, and a great artist. My first bicycle painting was a gift for my husband Jake, who is a bike nerd. Of course, that was before we moved to Portland where there is a totally different scale for bike nerdiness. Now he’s just normal. Jake’s greatest bike score was bringing an old butcher’s delivery bike back from York, England, and restoring it. That bike was a beast! BA: Where did you live before that? JA: Before Portland, I lived in Sonoma, in Northern California. There is so much great mountain biking there, but regular around-town riding can be wonky. I was hollered at to “get a car” more than once, and one time a teenage girl shrieked and lunged at me from the side of the highway, as if to push me out into the traffic. Of course, 99.9% of people are kind and civilized, but are still rather unconfident and unsure of how to drive around cyclists. Because Portland is such a big bike town, car drivers are really good at sharing the road. BA: You mention on your website that you used an old photo album for your beach scenes, and a 1920’s picture encyclopedia to mine odd subjects. Is that how you came across so many cyclists as subject matter? JA: I always paint from old photographs that I find at garage sales and on eBay. I just love the campy quality of so many of those old snapshots: dorky homemade Halloween costumes, people feeding babies bottles of beer, human pyramids on the beach. It just warms the cockles of my heart. And bikes turn up quite often in these shots. Combine that with my personal love of bikes, and it’s a natural fit. 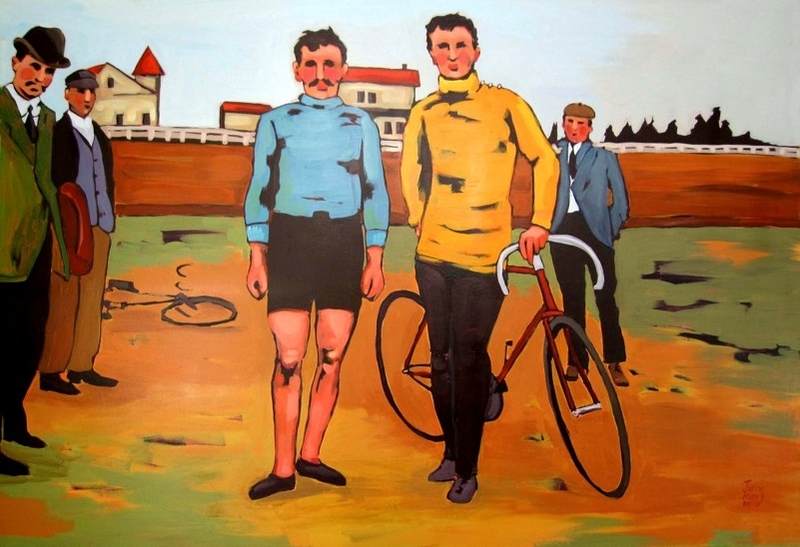 Plus, I’ve got to admit—the bike paintings sell well. But another thing I’ve always loved about cycling that draws me to them as subjects is that it’s really hard to be grouchy on a bike. I mean, unless you’ve got an uncomfortable saddle, you’re probably smiling—and we can really use more of that in the world. BA: So you yourself ride a bicycle often? JA: Yep, I ride. I’ve got a Celeste green Bianchi Milano. Man, she’s beautiful! My favorite material possession. I also have a 70’s Schwinn Twinn. 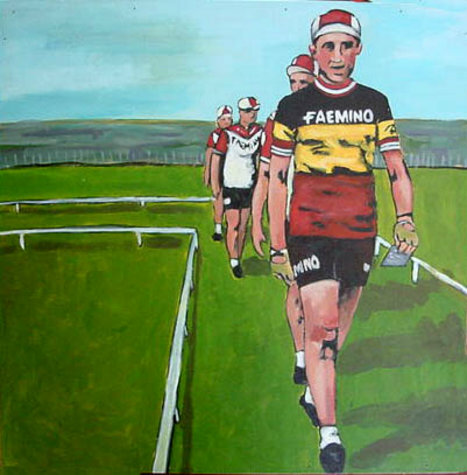 BA: Are there any aspects of bicycling and painting that you feel overlap in any sense? 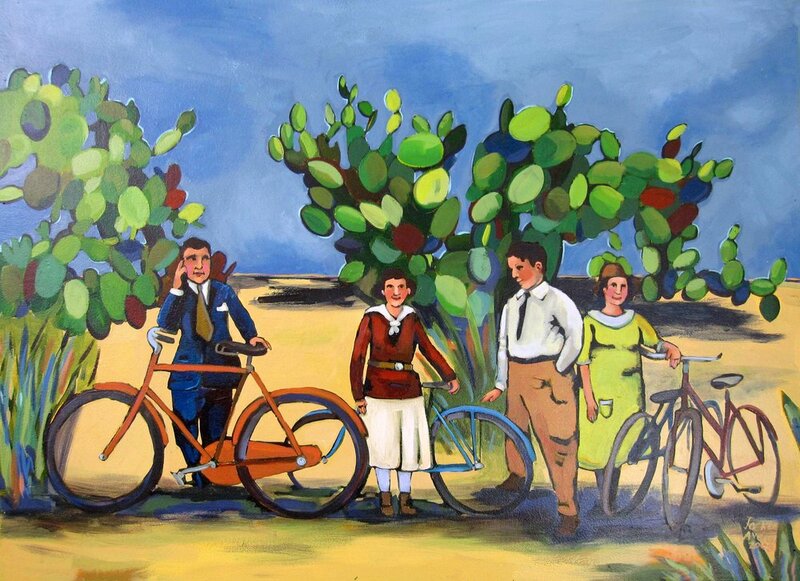 By that we are probably wondering in what ways you feel bicycling and art are similar experiences. JA: Riding and painting are actually quite similar. They can both be really difficult on a bad day. But it’s easier to throw in the towel on a bad painting day than on a bad riding day. When you’re out riding, you still have to carry on and get yourself home. Which actually is a good life lesson in general, right? But on a GOOD day, when you’re in a groove, biking and painting are so much alike. Time flies by, your brain goes on automatic pilot, and things just flow. Sometimes when I’m painting, I’ll get the feeling that I’ve just woken up and the painting is done. Sounds weird, I know, but cycling can have that same dreamy quality. BA: And so you'd consider bicycling and painting complementary pursuits? JA: Yes. 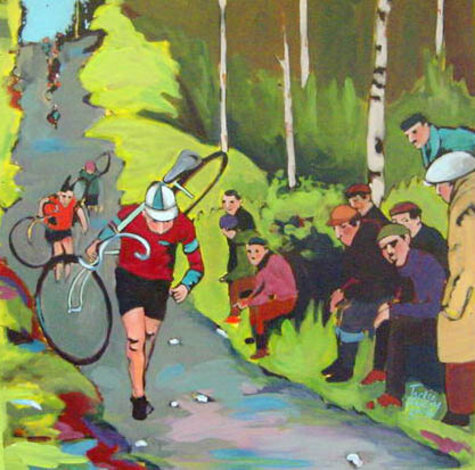 In fact, one particular benefit of riding a bike as a painter is that cycling is great for people watching. The French call a person who does this a flâneur. I love that they’ve named this activity, because it legitimizes it. Cruising around, at a human speed, you see the greatest vignettes of human life. I sometimes wish my eyes were little cameras, because so many scenes slip by that would make great paintings.